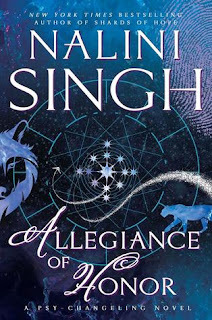 As you all know, I've become hopelessly obsessed with Nalini Singh's books. I cannot begin to tell you how much I have come to love them, but I can tell you that I have reread this series five times since I first marathoned it last June. See? I told you I'm obsessed. It is rather appropriate that a year after my initial reading of this series my marathon of Psy-Changeling reviews is finally coming to an end. Allegiance of Honor, the fifteenth book in the series, is out today! I was lucky enough to get a copy of it for review and I've already read it twice! It was SO good! 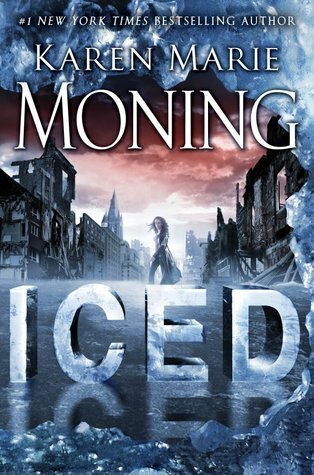 If you haven't started this series yet, you have plenty of books to marathon before book sixteen comes out next year! One thing I love about Nalini Singh is that she does things that are unexpected but very much appreciated by her fans. One of these is the sheer amount of bonus material she shares. I adore the short stories she features in her newsletter and later posts on her website. These vignettes allow us to get small sneak peeks into the lives of characters from the previous books. Now, imagine a whole book written in that kind of vignette format but with each one connected to the others to make a cohesive whole. I was hesitant when I first heard that Allegiance of Honor was going to be an ensemble book because I couldn't figure out how Singh was going to pull it off in a coherent manner. I really shouldn't have worried. There's a note from the author at the beginning of this book that the series is split into different story arcs. Shards of Hope ended the first arc and Allegiance of Honor is very much a setup book that segues the series into the next arc. It ties together several loose ends hanging around after the fall of Silence and at the same time it also kicks the story in a new direction. The format makes it hard to review without spoiling things but I will say that it does an excellent job of introducing the new story arc while checking in with all of our favorite characters from the previous books. A lot has happened since the end of Slave to Sensation but the most notable is the number of intricate relationships that have developed to connect the Psy, Humans, Forgotten, and Changelings together. These connections provide a back bone that helps us to more fully understand the changes that are happening in the Psy-Changeling world with the fall of Silence and the new Trinity Accord. The ensemble cast really highlights these relationships and gives us multiple points of view to see how devious The Consortium is. Almost all of the major characters in this series gets some page time, so keep an eye out for your favorite pairings because they'll pop up at some point. And if that wasn't enough, we also get some insight into a few characters I've been dying to know more about. The most prominent is the Blacksea pack and I can't wait to learn more about them! I just want a book with at least one of the love interests to be from Blacksea! Or both! Just think of all we'd learn if both the hero and the heroine were water changelings! I seriously love how this book sets up so many possibilities for featured characters in future books. I'm going to keep my fingers crossed for another Psy/Forgotten couple but I think it would be awesome if we got a Forgotten/Changeling couple. I also want more time with my beloved Arrow squad. I would totally read a whole series exclusively about the Arrows dealing with the fall of Silence and finding their places in the world. This book was everything I was hoping for and more! It made me laugh and it made me cry in public. I couldn't help but hug my kindle to my chest when I finished it because it was so delightfully wonderful! There are so many possibilities as to what could be coming up that I cannot wait to see where this series takes us next! It's going to be a long wait for the next book.